As far as I can remember, I've always spent the winter holidays in my hometown Rome. Beside the warmth of my beloved family and friends, the great food and the often beautiful weather, there's also something else making the city very special in the cold season. Every evening, in fact, hundreds of thousands of starlings fly into the city from its sourroundings, to gather in some particular spots they use as common nocturnal roosts. The dynamic of flight and the behaviour of each single bird, multiplied by thousands time as they cluster into huge swarms, create a marvellous array of incredible patterns and abstract shapes in the sky. 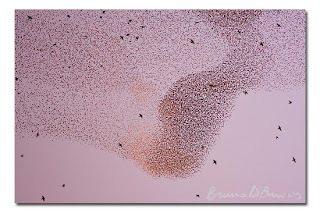 As masterly depicted by Manuel Presti in his famous pictures, the flocking behaviour of these birds shows all its evolutive efficacy as defensive measure against the attacks of the Peregrine falcon, common presence at the evening gatherings. Well protected against the droppings "bombing" from the sky, once again I couldn't miss this annual spectacle with my camera. And, of all the images recently taken at the site, I've chosen this particular one, where the last sunrays are being reflected by the wings of some birds in the swarm. And, as soon as those moved away from the light, other birds were reached by it, therefore creating a beautiful impression of golden waves crossing the flock. What a special moment for me to begin a new year of nature and photography! If you want to discover the most secret corners of Rome and enjoy the spectacular behaviour of the flocks of starlings, get in touch with the Author or stay tuned on this website: we are organizing a dedicated workshop for winter 2008 -a unique opportunity to explore this city and its wonders with your camera. More informations coming soon!